At the start of 2016, instead of making New Year’s resolutions I started a gratitude jar. Each day since January, I would try to write a short note on a little piece of paper on what I was grateful for on that day. When I became a mom last year, somehow finding even the smallest things to be thankful for, particularly after a long, grueling day helped me in this intimidating new role. A small human being needed me almost every second of the day. He was crawling. Trying to walk. Trying to climb.I would be filled with so much joy and pride one minute. And then get a couple of little heart attacks the next every time he would stumble or appear like he was about to fall. He would put his little arms around my neck for a ‘gigil‘ hug one second and unleash a storm of screams the next. Focusing on even just one thing (because there a hundred of small things, really) at the end of the day that I was truly grateful for was a joy. I wanted to remember all those small things, so now I have this jar getting filled with little notes. Getting to have a movie night with the husband. Listening to Z belt out “Twinkle, twinkle little star.” Having an hour to catch up with a girl friend while my mom watches over Z. Or milestones. Like turning 40 for me and Z turning two. Last year, before I started the gratitude jar, one of the days I was thankful for was the time my husband and I went on our first road trip with our son. We wanted to see how he, no, we would all handle traveling together, even for just two-three hours on the road to the nearby weekend destination that is Tagaytay. I think I was glued to my chair for most of the 10 hours I spent in the office today. It wasn’t pretty. It was one of those days when you’re just so exhausted you don’t even have time to taste your food or say anything to your concerned husband on the drive home. Thank God for an evening in bed with a funny, easy read (Mindy Kaling, I want to hang out with you! ), great music, and music videos shot on location in Japan. Just a few more days to go. Reading or watching the news for the past few days has just been so heartbreaking. When super typhoon Haiyan (local name, Yolanda) slammed into central Philippines last Friday, I don’t think many of Filipinos ever imagined the scale of the devastation it would cause when it made landfall. We Filipinos are used to typhoons. Almost every year, there’s a big one. But this one was the biggest so far (it made world record as the strongest tropical cyclone to hit land in world history) and while Metro Manila and many parts of the country were spared, the images coming out of the hard-hit areas like the provinces of Leyte and Samar are just harrowing to watch. You can’t not be moved. There are now many relief efforts being conducted; there are many ways to help. Here’s a list from Yahoo Philippines and The Happy Lab. 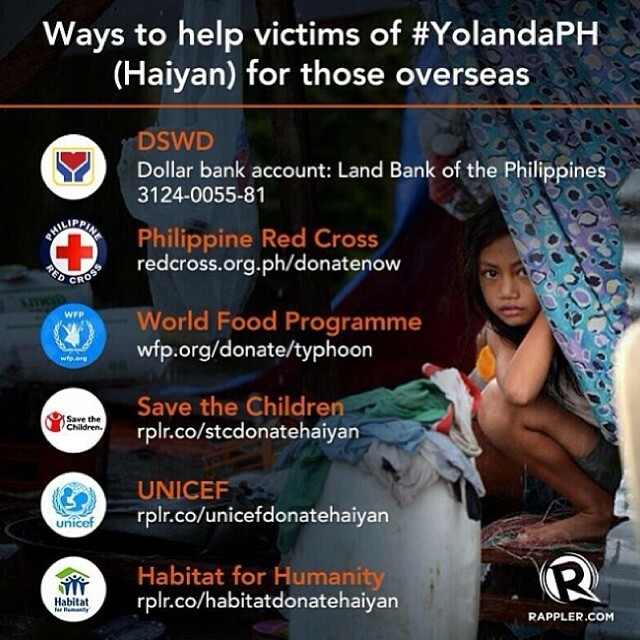 Below is a list of how to help if you’re overseas. UNICEF even lists how the cash donation will be used, which certainly provides perspective on how much your donation can affect more than one person or child. 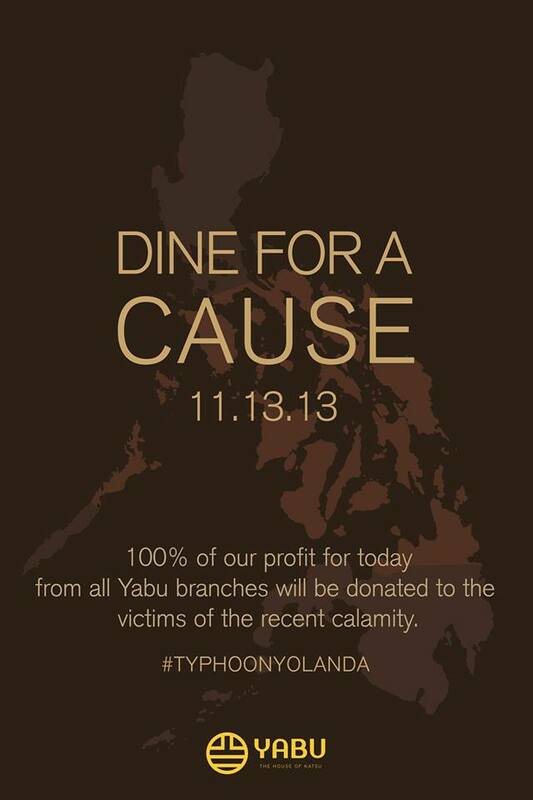 A few restaurants here in Metro Manila, like Yabu: House of Katsu, have also extended their help by pledging to give 100% of their profits for a day to the victims affected by Typhoon Yolanda. “Our restos Brgr Burger-Project, Pino Filipino Comfort Food, Pipino Vegetarian, Brgy Bagnet, and Pi Breakfast & Pies will be donating 100% of our profits tomorrow, Nov 13, Wednesday to the Red Cross for the relief operations. Ate in all of the above mentioned restos except for Pi: Breakfast & Pies and you can definitely get great food there. Or nourish your soul by getting hold of some new poetry books. My sister’s group is organizing a book sale to raise funds for Yolanda relief efforts this Nov. 15 and 16. All sales will be donated and donation details will be posted once finalized. It’s Japan month! Let’s go to the movies! Okay, technically, it’s Philippine-Japan Friendship Month, which Japan Foundation Manila holds every month of July. And one of the things I look forward to every time this month-long festival celebrating Japanese culture comes around is Eiga Sai! The Japanese Film Festival started last night at the Shang Cineplex in Shangri-La Plaza Mall with another interesting collection of Japanese movies that normally just wouldn’t get screened in the country. But from July 3 to July 14 they will be shown in Shang, from July 19 to 28 at Abreeza Ayala and FDCP Cinematique in Davao City, from August 7 to 11 in Ayala Center Cebu (yes, the Japan ‘month’ extends outside Metro Manila), and its last stop will be on August 19 to 25 at UP Film Institute in Diliman, Quezon City. Mai Mai Miracle. Set in rural Japan, this animated feature revolves around the friendship between a young local girl with a rich imagination and a girl new in town. According to Genki Jason, if you like Studio Ghibli movies, then you’ll like this. 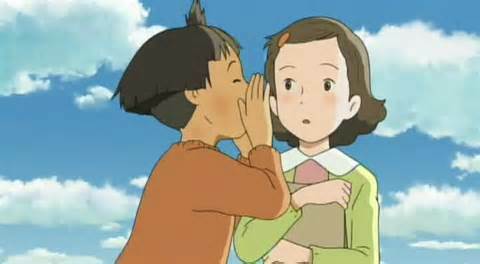 No, it’s not a Ghibli movie–it’s actually produced by Madhouse, the same folks behind Summer Wars and The Girl Who Leapt Through Time–but it looks like one and as Jason writes, “the animation was intoxicating in its detail.” (See his complete review here).